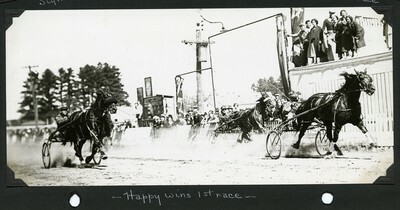 Black and white action photo of bay gelding, Happy, Mason up, driving for the finish line in the first race of the third day of the Oxford County Fair, September 14, 1935, South Paris, Maine. Bay stallion, Calumet Elam finished the race in second place. Hanover Courier, a chestnut gelding finished the race in third.